Wells: one of the finest family vacation spots anywhere. With miles of continuous sandy beaches, an abundance of outdoor activities and friendly folks, families return year after year because Wells is a wonderfully friendly, convenient locale with miles of smooth beaches with no close comparison. Wells Main Beach offers over 1.5 miles of continuous sand, dunes, tidal pools, and jetties surrounding the opening to Wells Harbor. Wells Harbor offers launching areas for boats on trailers, kayaks, and canoes. Wells Harbor Community Park is home to a gazebo for summertime performances and multiple other amenities, including a playground and observation deck. 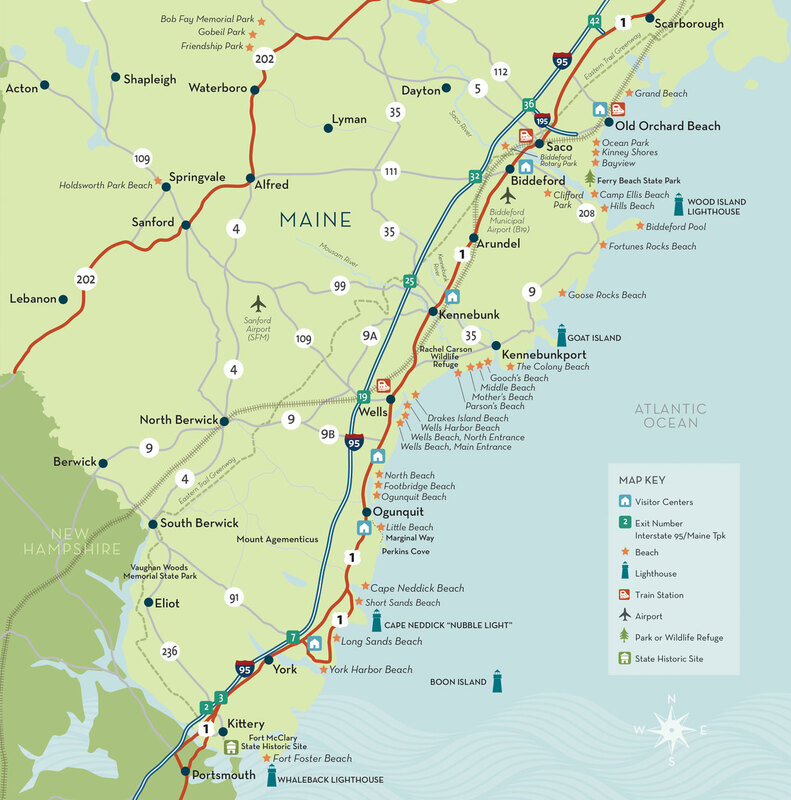 Those who stay here are familiar with the myriad of dining options as well as one of the widest arrays of lodging in all of The Maine Beaches—from beach-front cottages and condominiums to inns, guest houses, and B&Bs and an excellent collection of hotels and motels. A dozen or more campgrounds offer services ranging from simple tenting sites to full-service recreational vehicle sites. While other beach communities offer more mainstream retail and shopping, Wells delivers the vintage advantage—a broad collection of antique malls and independent dealers that have helped make Wells the Antiques Capital of Maine. Wells is home to the internationally recognized Rachel Carson National Wildlife Refuge. The universally accessible Carson Trail offers a one-mile loop through a pine woods with tidal salt marsh views. We also invite visitors to the Wells Estuarine Research Reserve at Laudholm, a breathtaking natural attraction with trails, estuary kayak tours, kid-centered programming (including camps), interpretive tours, and special events like musical performances. The Town of Wells Wildlife Commons is located on the quieter side of our wonderful town, sharing diverse southern Maine landscapes like trout streams, tall forests, and cascading waterfalls. Come enjoy the serenity of hiking, nature photography, or the simple joy of a woodland picnic. The centerpiece for the Wells Regional Transportation Center is the Downeaster, operated by Amtrak, a passenger train with five daily departures from Boston North Station, as well as Greyhound Bus Service. The center is served by taxis and an in-season trolley service.